A blog for nerdy parents and their offpring. A blog for nerdy parents and their offspring. Yesterday DC Comics announced the launch of DC Super Hero Girls a line of videos, digital games, books and toys marketed to girls. Beginning in Fall 2015, DC Entertainment, Warner Bros. Animation, Warner Bros. Consumer Products and Mattel join forces to launch DC Super Hero Girls, an exciting new universe of Super Heroic storytelling that helps build character and confidence, and empowers girls to discover their true potential. Featuring DC Comics’ most powerful and diverse line-up of female characters as relatable teens, DC Super Hero Girls will play out across multiple entertainment content platforms and product categories to create an immersive world. 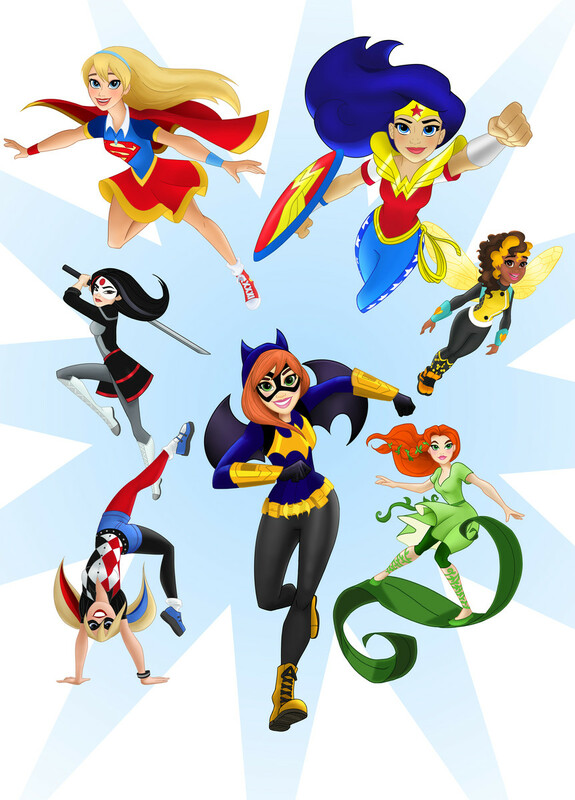 Developed for girls aged 6-12, DC Super Hero Girls centers on the female Super Heroes and Super-Villains of the DC Comics universe during their formative years—prior to discovering their full super power potential. Featuring a completely new artistic style and aesthetic, DC Comics’ icons such as Wonder Woman, Supergirl, Batgirl, Harley Quinn, Bumble Bee, Poison Ivy, Katana and many more make their unprecedented teenaged introduction. Each character has her own storyline that explores what teen life is like as a Super Hero, including discovering her unique abilities, nurturing her remarkable powers and mastering the fundamentals of being a hero. Mattel category-leading firsts include a line of characters for the action figure category, an area of the industry that has been primarily developed with boys in mind, and fashion dolls featuring strong, athletic bodies that stand on their own in heroic poses. Internet commenters have already pointed out that making a line targeted to girls is “othering”, deepens the divide between the genders and accentuates the thought that girls need something different than what boys need. I especially dislike the use of “Just for girls” and “exclusively for girls” language in the full press release. These are all valid points, and marketing to specific genders is always going to be problematic in some ways. Let me tell you, though, why I am excited about this new line. When I was a little girl I loved playing with action figures. I had Thundercats, WWF wrestlers and He-Man, and none of my female friends ever wanted to play with them. When friends came they would almost always want to play with my Barbie collection, not my action figures. When She-Ra debuted I went nuts. I was a girly girl, who happened to like superheroes and so She-Ra was a dream come true, I think I had all the figures, a castle and some sort of bathing/pool thing. I watched the cartoon religiously. (I really cannot express how much I loved She-Ra. When I threw pennies into a fountain, I would always wish for She-Ra to be real.) As a bonus, my non-superhero-loving female friends were totally into her, too. I finally had a way to share my geekiness with my female friends. The fact of the matter is that girls and boys are already being marketing to separately. Boys get building toys, cars and super hero action figures and girls get doll babies, barbies and froufy dress up clothes. DC (and LEGO before them) is actually bridging the gender gap here by taking something that is traditionally found in the “boys” department and making it appealing for the “girls” aisle. The two aisles exist, I don’t see that changing anytime soon, so I am happy to see more diversity in what’s offered. As I’ve written before (about my own daughter), there are going to be girls who choose to shop for the “girly” things. They love sparkles and ponies and princesses, and that frilly pink aisle is where they want to be. I am so excited that those girls will have a line of fashion dolls that are empowering. If these toys encourage a girl to pick up a comic book, to discover a love of superheroes, or just give her a different way to express herself, this is a win. This is not a political blog. Is Cirque du Soleil’s LUZIA good for kids? Suzanne on Captain America: Civil War – A Parents’ Guide. Can I bring my 6 year old to Captain America Civil War?